On the 20th day of May, 1890, my grandmother, Matilda Davis, and her two little boys left their place in Tombstone to join my grandfather, Martin, in Bisbee. It was a long, jarring wagon ride through a deep canyon to the top of the Mule Mountains, and then down the other side into Bisbee. At the time, Leadville, Colorado, the gold and silver Mecca of the west, was panning-out and Bisbee was the place to be. Folks from Leadville and other mining towns were pulling up stakes and flocking to this mile-high, copper-rich boom town. In the glory days, Bisbee was the largest city between St. Louis and San Francisco, with a population of more than 22,000 residents… a virtual melting pot of immigrant miners and settlers that included my Finnish grandfather and Norwegian grandmother. Nine years after settling down in Bisbee, my grandmother gave birth to her fourth child, my mother, Anna Barbara Davis. Soon after, grandma Matilda suffered a nervous breakdown and was taken to the state hospital in Phoenix, never to be seen again. Life was hard on frontier women and many cracked under the strain - men, too. A miner’s life at the turn of the twentieth century was an unrelenting struggle to survive. Baby Anna was farmed out to Mrs. Mattern. 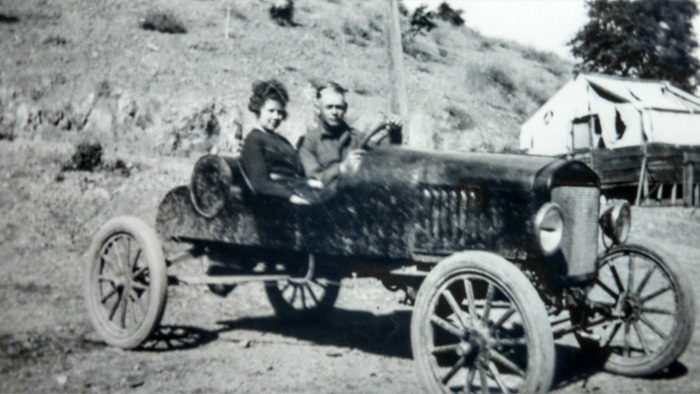 Tuck Potter and his wife, Allie, took little brother George and Martha Gillis took sister “Bernie.” My uncle Charlie, the eldest brother, was 12 at the time and felt “man” enough to strike out on his own. More on his amazing adventures, later. The growing-up years that followed were filled with big events, social upheavals, devastating floods and fires and around 1917, a military invasion that took Bisbee by storm. Under orders form President Woodrow Wilson, Brigadier General John “Blackjack” Pershing and his troops were to carry out a punitive expedition into Mexico to capture or kill the notorious Mexican revolutionary, Francisco “Pancho” Villa. A tented army camp for Pershing’s men had been set up near the Mexican border, just 27-miles from Bisbee. While off duty, these fresh-faced soldiers provided exciting distractions and the promise of new beginnings for many of Bisbee’s sheltered young ladies. Among them was a enterprising, good looking teenager from Whiting, Missouri named Julian "Julio" Collier. Even though he didn’t know how to drive a motor vehicle, he had talked his way into becoming one of the drivers in the U.S. military’s first major motorized combat operation. After that shifty maneuver he felt confident he could talk his way into the heart of a young Bisbee lass who had caught his eye at a base dance. My mother and father were married on April 30, 1919. She was a Western Union clerk, and after leaving the army, he and a buddy, Bill Ryan, became Bisbee’s first motorcycle police officers. Julio and Anna were Bisbee’s “fun” couple, handsome, care free and child free for almost 10 years, until my sister, Mary Ann was born. With her birth the town’s gossips stopped sending hate mail accusing mom and dad of leading spoiled, selfish lives. Two years later tongues really stopped wagging when I was born on September 23, 1930. It was the start of the Great Depression and the last of the fun times.